In an attempt to remain organic in the vegetable plot we try not to use any chemicals - natural control is our preferred method i.e. Toads and hedgehogs eat slugs, rhubarb as a pesticide, horsetail as a fungicide. Waking early yesterday morning we were surprised to see the tail end of a fat hedgehog stuck in the front gate. Pouring with rain we ventured out to find the poor little fella well and truly stuck........Not able to move forward or backwards. After half an hour of gentle teasing, tugging and pushing, attempting to ease the bars open and trying to cut a bar with a metal saw we managed to rescue him. The little fella/madam (eventually named Geraldine!!!) was exhausted. We nursed her all day in the boiler room with plenty of water and cat food. Needless to say Wentworth and Gawber were intrigued by this new addition and spookily seemed to know the little hog wasn't 100%. After taking advice, we decided by early evening that she had recovered enough to be released. We released Geraldine in the bottom of the garden near to a small meadow. After 15 mins curled up in a tight ball, Geraldine stretched out and tootled off into the long grass - appearing no worse, perhaps a little bruised, for her adventure. Let's hope he continues to munch on our slugs for a few more years yet. Judging by the sheer number of slugs we have this year it is no wonder she is such a tubby little thing. Good luck. 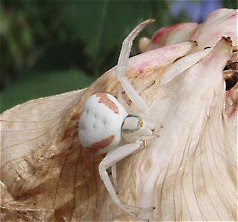 Found this little mite when dead heading the white roses - Misumena Vatia, apparently rare spider that lives in/on/around white flowers. Needless to say I will be using gloves from now on for dead heading. The weather has been very unsettled for most of May and for the beginning of June with a lot of rain and low cloud. The seedlings have suffered and it looks as though we have lost the majority of the tomato plants. The potatoes had to be harvested early due to an attack of blight and the beans, peppers, carrots and aubergines have succumbed to the ravages of slugs, snails and crane fly larvae - now all will be re-sown and fingers crossed they will germinate in time to crop later in the year. The bad weather has given us an opportunity to catch up with jobs around the house and workshop. Lights now installed in the workshop, the wood store half built and pine chest stripped and waxed. Luis has been very busy re-caning chairs (5), making pebble mosaics and working as an interpreter. The kittens (now cats really but hey) have been a bit subdued with the rain but manage to catch the odd mouse or shrew between showers. They are growing fast and take no notice what-so-ever of commands, instructions or bribes. They love climbing trees and can be often found in the top branches of the apple trees, jumping from limb to limb and occaisionally hanging on by out-stretched claws.